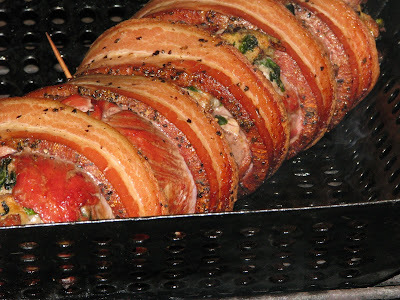 Bacon wrapped meat log is not the most original name. 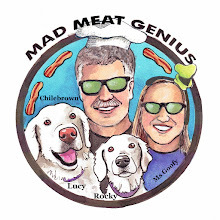 When you taste this super moist, spicy, mouth watering collection of meats and vegetables you may agree that meat logs are the Bomb. 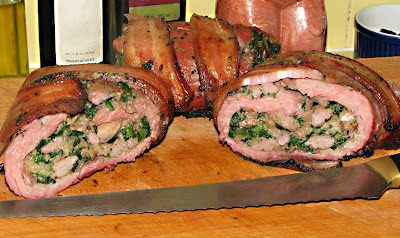 This meat roll is stuffed with a porchini mushroom, spinach and sausage stuffing. 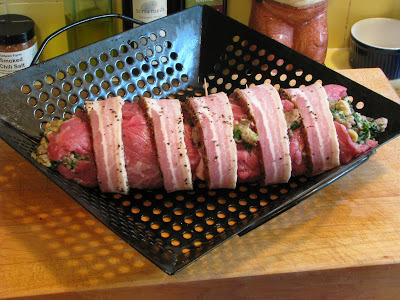 The stuffing is held together by a seasoned butterflied flank steak. This meat tube of love is cradled by bacon, of course! There was a short break in the rain to allow this creation to be bathed in a fiery mesquite charcoal fueled sauna. 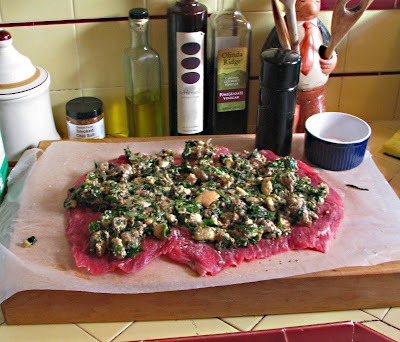 The only difficult task in this preparation is the butterflying of the flank steak. If you feel uncomfortable doing this task, I am sure your local butcher will oblige. Ladies and Gentlemen, lets go to the kitchen. Soak the porchini mushrooms in 1 cup of hot water for 3o minutes. After 30 minutes remove mushrooms, reserving water, and chop. Cook your sausage for about 5 minutes. After 5 minutes add garlic, onion, and mushrooms. Season with salt & pepper. Cook for 10 minutes or until sausage and vegetables are done. Take off heat and add spinach and bread cubes. Add approx. 1/4 cup of mushroom soaking liquid to make a moist mixture. When mixture is cool add egg and stir throughout. Take your stuffing and spread over meat that is on wax paper, Using your wax paper roll meat and filling into log. Wrap bacon around log and secure with tooth picks. 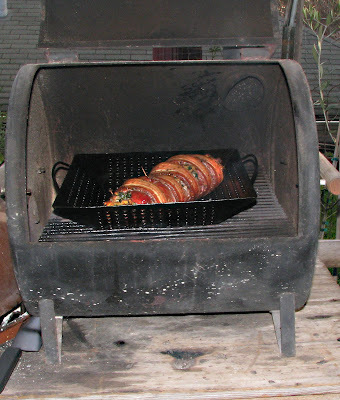 Cook in oven (400 degrees) or medium heat barbeque for 35 minutes until desired temperature. I pulled the meat log when the internal temp. hit 125. This came out to a perfect juicy medium rare. There was a little break in the weather and firing up the barbeque was just what we needed to snap us out of our rain fueled funk. A great dinner and a fire topped off the day. Words cannot describe how good this Bacon wrapped meat log turned out. The stuffing was moist with a wonderful mushroom and sausage flavor. The image will give you a glimpse of meat heaven. We served this with some rice and a green salad. I know tonight my dreams will be about leftovers! Okay, that looks seriously delicious! Bravo! I'm proud of you for lighting the barbecue, too, between the rainstorms. 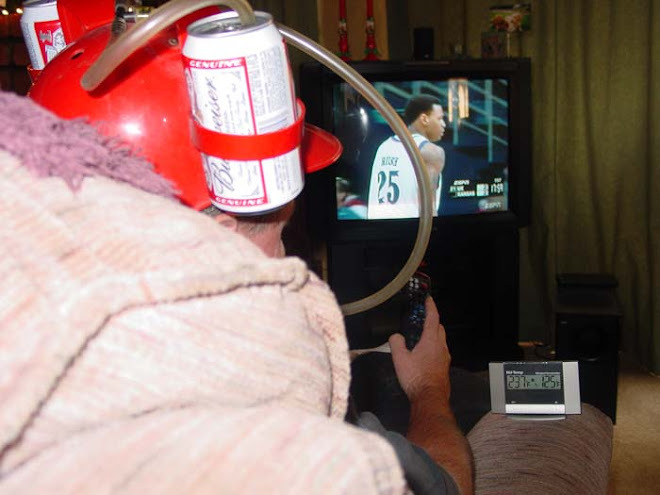 I love the top photo with the Budweiser in the hat. I need one of those for game days! That sounds great. I've never butterflied a flank steak before but if I can spiral slice a pork loin, I'm sure I can handle the flank. Love your choice of fillings. Great job, making me drool. "This meat tube of love"
Looks awesome and I'm glad to see you didn't get arrested for lighting that cool little grill. That looks incredible. I just finished dinner and now you got me all hungry again. Zoomie, Firing up the barbeque is a Zen like experience for me. Zia, Sometimes things fall into place. We were happy. highlandsranchfoodie, Man poor old Bret got beat up pretty good. Martha@Menagerie, The beer helment does come in handy. Chris, All you need is a sharp knife and a steady hand. Greg, I had a feeling you would catch that. I did not even check their website. Our local government was not going to ruin the moment. WhiteTrashBBQ, Thanks, In 3 weeks is our first judging gig. It will be a CBA competition. Beautiful ring of meat and smoke ring to match. This has super bowl sunday written all over it! "For When There's Not Enough Meat in Your Meat." You nailed it, friend! It was 19º here last night, and I fired up the Weber to grill some burgers. The things we done for love of meat.